The South African Leopard tortoises are less common in collections because they stopped imports from South Africa before other countries in Africa. Based on new DNA testing leopard tortoises are no longer broken into subspecies, though in the pet trade we still see the South African Leopard tortoise identified as S. p. p.
The typical identify mark has been two black dots in the middle of scutes on hatchlings, however not all hatchlings observed in S. Africa have two dots. While the South African leopards grow larger than those from a lot of the range, the tortoises from Ethiopia & Somalia grow much larger. We found a 29" male in Ethiopia which is larger than "Car Jack" the once recognized largest South African Leopard in Addo Elephant Park. 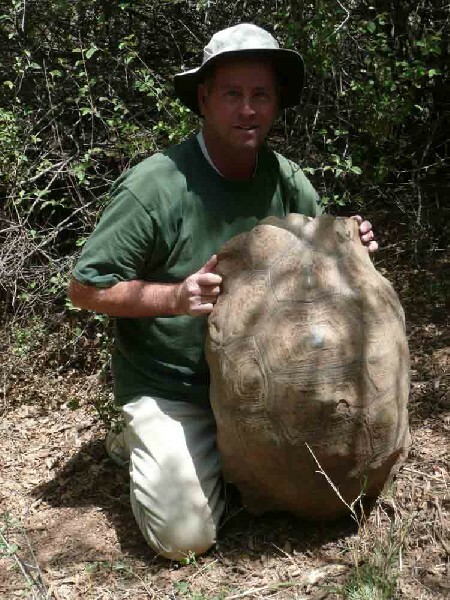 The typical leopard tortoise we found in Ethiopia was much larger than the typical leopard found in South Africa.